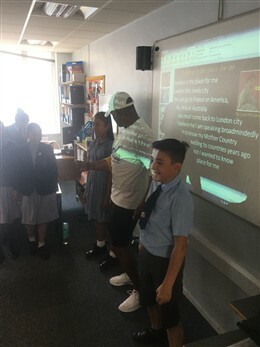 Paul Canoville told Y6 children at Servite school about his mother Udine's ambition to become a nurse in the new NHS. She was part of the Windrush generation that the class celebrated through the calypso song 'London is the Place for Me' (by Lord Kitchener). 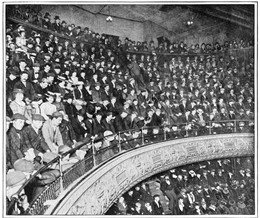 Lambeth Walk became a popular song shortly before war broke out in 1939. It is associated with the Pearly Kings and Queens of London -costers who raised money for their community in times of need. 'Don't Dilly Dally on the Way'-or 'My Old Man said follow the Van' was a song that emphasised the precarious nature of working class life in London before the Welfare State. Most people rented and often had to disappear swiftly into the night to leave their debts behind them. 'Knees Up Mother Brown' had been sung on the streets of London at the Armistice in 1918. Celebrating VE Day, 8th May 1945, a cockney 'knees up' of epic proportions demanded athe song made an appearance. 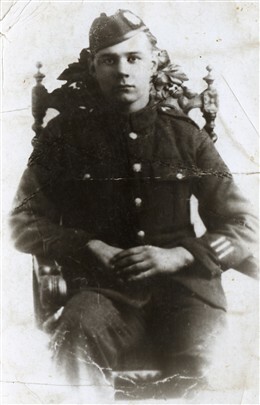 Pte Georgie Seaby returned from WW1 with a serious headwound that affected him for the rest of his life. When he couldn't work as a flower seller it was his family and fellow costers that helped him out. William Blake’s famous poem was first set to music in 1916 by Hubert Parry and rallied a nation shaken by the slaughter on the Somme, with the promise that England could one day see a heaven on earth. In 1945, Prime Minister Attlee would invoke this theme to create a Welfare State based on the Beveridge Report(1942), which had outlined a vision for a national health service that would slay the five giants: Want, Disease, Ignorance, Idleness, and Squalor. The latter left a bitter taste in many mouths. 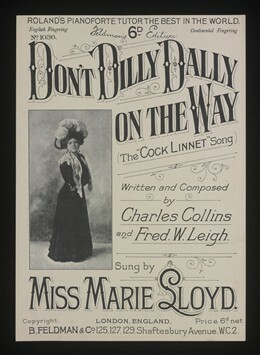 Prime ministerLloyd George’s had promised “Homes for heroes,” but post war reality was a housing crisis you can hear in My Old Man, a song written from 1919by Fred W. Leigh and Charles Collins, in which Marie Lloyd sang about doing a ‘moonlight flit’ -moving house after dark to avoid paying the rent. Music provided escapism and enhanced a community spirit emphasised by popular songs such as "Let's All Go Down the Strand (have a banana!)." Written in 1909 by Clarence Wainwright Murphy and Harry Castling, it celebrated the route to London’s fruit and vegetable market, and home of Covent Garden’s costermongers or barrow boys. Costers developed a strong sense of ‘otherness’ brought home by Flanagan and Allen’s, ‘All My Life I wanted to be a barrow boy’ which celebrates working class camaraderie. Private Georgie Seaby returned to Covent Garden from the Somme with a silver plate in his skull. Georgie literally turned his ‘back on all of high society’-to those who had promised ‘homes for heroes’ but left men like him crippled by war. Lambeth Walk has become synonymous with the Pearly King and Queen’s-who helped raise money to support the coster community. 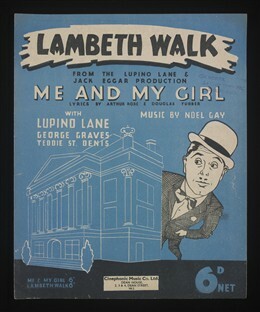 Released in 1937 for the musical Me and My Girl (lyrics by Douglas Furber and L. Arthur Rose and music by Noel Gay). The tune gave its name to a Cockney dance made popular in 1937 by Lupino Lane. It was all the rage as Joe and Dibs Seaby welcomed their daughter Patsy-Ann’s birth in April 1938. On September 7th 1940, whilst this young family sheltered in terror from the Blitz, veterans shared trench-songs like Bombed Last Night to bolster spirits. Four years later, Hubert Gregg’s Maybe it’s Because I’m A Londoner summoned up London pride to overcome the terror of the V1 Doodlebug and V2 rocket attacks. By then Private Joe Seaby was in Italy recovering from the horror of Anzio. He was in the same regiment, the Royal Fusiliers, as 2nd Lt Eric Walters, one of many men sacrificed to hold the Anzio beachhead. His son, Pink Floyd’s Roger Walters sang about his death in the haunting ‘When the Tigers Broke Free’ (1982). The anguish of Anzio reflected in this song can be seen in the shell-shocked features of Joe Seaby. 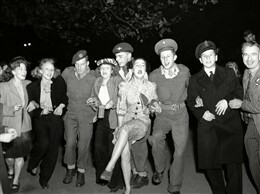 Londoners celebrated VE Day, May 8th 1945 in the same way they had celebrated the end of the First World War, they went out into the street and sang Knees Up Mother Brown. Not recorded until 1938, by Bert Lee, Harris Weston and I. Taylor, "knees up" became cockney shorthand for a party. Two weeks before the NHS opened its doors on July 5th 1948, the SS Empire Windrush arrived at Tilbury Docks Essex. The Windrush generation arriving from the Carribbean would staff the hospitals of the new NHS. Aboard the ship was calypso singer Lord Kitchener, whose optimistic anthem ‘London is the Place for Me’ pointed towards a brighter future for all in England’s green and pleasant land. Patsy-Ann Daniel nee Seaby died from ovarian cancer on February 10th 2018. Fields of Gold was her favourite song and the original lyrics by Sting were adapted by musician Vince Burke for the Towards a New Jerusalem project. Vince’s word s above emphasise that what underpins the NHS is the strong sense of community that forged it. This page was added by Peter Daniel on 12/03/2019.